As part of your trip for culture, relaxation and our Sahara tours we’ll collect and return you to any airport. We won’t take you to shops you don’t want to see and at all times your safety is paramount so we don’t rush about. We run Sahara tours and private tours for families or friends using Toyota 4×4 Landcruisers and occasionally a minibus if requested for larger parties. 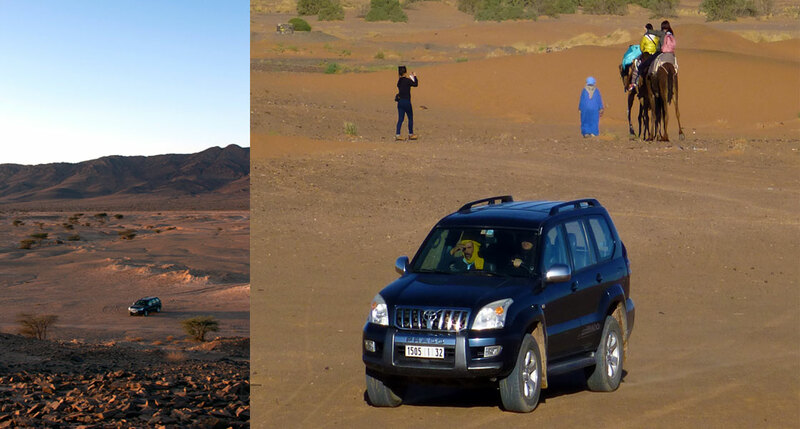 The 4x4s offer a good degree of comfort for a maximum 4 adults and one child and are ideal for Morocco desert tours and conventional road surfaces of which there are many in Morocco. The roads aren’t too bad but traffic is slow so distances on a map can be misleading. Once you’ve expressed an interest via our contact form we’ll get back to you with an itinerary and price including our suggested hotels and Riads which are a minimum 3 star rating. If luxury is important to you then let as know and we’ll offer you some superior accommodation. The tours are inclusive of breakfast, evening meals and all accommodation, including desert camel treks and overnight stay in the desert camp as part of any Morocco desert tour. For the activities you wish to do on the tour, please let us know what you would prefer during correspondence. You have the flexibility however, to confirm these once you’re here. We’ll arrange these activities for you and payment for these are to the suppliers in local currency once you’re here. For all other essential information about the tour including details like what to bring and how to change money we’ll send you this upon booking. We’re sure you have questions so once you get in touch with your Sahara tours ideas we’ll get back to you with a quote.